You can find "Settings" in the cog menu. 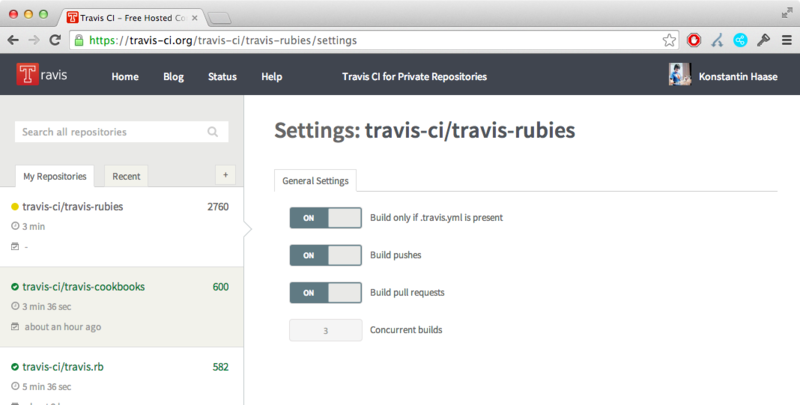 Travis CI puts a cap on how many builds can run for your project at the same time. Previously, this solely depends on the number of builds running for the same account. The maximum number on travis-ci.com depends on your plan, on travis-ci.org it depends on the overall system load. 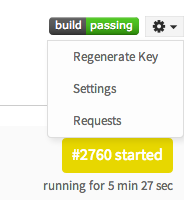 We have now added the option to limit the number of concurrent builds on a per project bases. Just head over to the recently launched Settings pane, and you will find a new input field there. This feature will of course not allow you to go beyond the account limit, but you will be able to reduce the number of builds for your project. The [Settings pane](/2014-03-05-repository-settings/) now allows you to limit the number of concurrently builds per project. You can avoid builds running in parallel by setting the concurrency to 1. This might be useful if your build is depending on an external resource and might run into a race condition with concurrent builds. A single repository will not use up all your account’s builds. This might be useful when working in larger organizations. We are continuously working on a better CI experience, so let us know what you think!